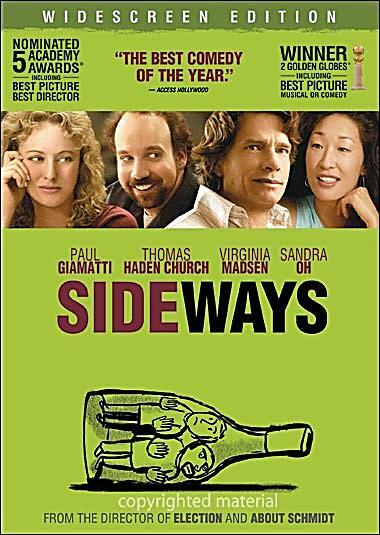 Sideways (2004) | Tales From The Ipe! As they’re both nearing middle age with not much to show for it, the two will explore the vineyards while ultimately searching for their identities. Giamatti’s character is a wine lover, or oenophile, so there’s a lot of wine tasting and drinking. They meet up with Madsen and Oh, and life ensues. Madsen and Oh were enjoyable. I was wondering what all the hubbub was about this movie when it came out, as it was nominated for many awards, and won other others, such as the 2005 Academy Award for Best Writing, Adapted Screenplay, The Golden Globes Best Motion Picture – Musical or Comedy, etc. It’s an interesting movie, if only to watch the actors interact and emote, and the writing was excellent. It’s not a life-changing movie, though I may want to try a nice pinot noir the next time I’m out for dinner.